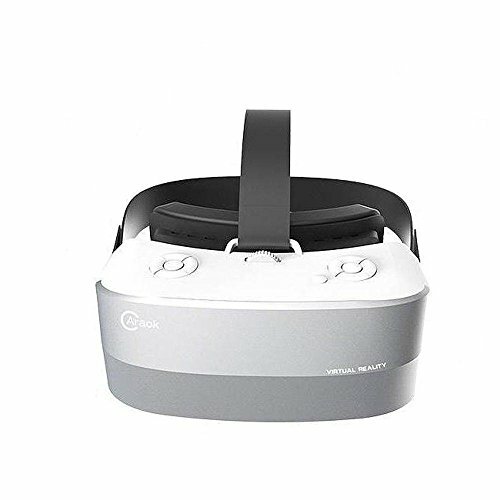 All in one 3D VR headset, excellent audiovisual experience. Interface: USB, TF, 3.5mm earphone slot, OTG. All in One 3D Glasses -- No phones needed, no computers, no gear. The Caraok 3D VR is built-in an Android interface, making it ready to use right out of the box. With USB and TF slots for external capacity. GEO-Gyroscopic 3D -- Explore 360 degree universes in 3D that respond to your gaze and movement, no need a base station to calibrate. Wireless Connection -- connect with Google Play and YouTube through the onboard Wi-Fi or Bluetooth, you can download thousands of games, movies, and App. Ultra Portable -- Built-in a 3200 mAh battery, you can enjoy long and uninterrupted sessions of 1080P VR. Package List -- 1 * VR, 1 * User Manual, 1 * Cleaning Cloth, 1 * Power Adapter, 1 * USB cable, 1 * headphone, 1 * Head Strap. Full 12-month warranty, any problems, feel free to connect us! If you have any questions about this product by Komire, contact us by completing and submitting the form below. If you are looking for a specif part number, please include it with your message.